(CNN) -- Terror attacks have come with depressing regularity to Mumbai -- and each time the city, brought to its knees, has dusted itself off and forged on. 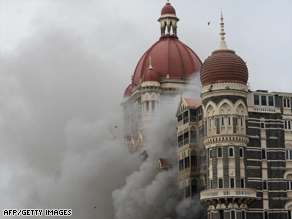 The iconic Taj Majal hotel on fire was a difficult sight for many Mumbai residents. It did so in March 1993 when more than 250 were killed in a series of bombings on the stock exchange, on trains and at hotels. It did so in August 2003 when two taxicabs loaded with explosives blew up outside a crowded market, killing 50. And again in July 2006, when bombs ripped through packed commuter trains and platforms during rush hour and took 209 lives. This time, residents say, is no different. "Am I being more careful when I go out? No, not at all. Why would I change my habits?" said resident Netra Parikh Saturday. "I'm a proud citizen and I'll face and fight for anything that comes my way." Authorities locked down the city of 13 million and asked residents to stay inside Thursday. The stock market in the city -- the financial hub of India -- was closed, as were schools and colleges. The city is also home to Bollywood, the world's most prolific film industry. The very next day, a shell-shocked Mumbai gradually hobbled back. The stock market reopened as did some businesses. Most high court judges sat for cases, but adjourned court after few lawyers and litigants showed up. More people stepped outside, apprehensive but defiant. But false rumors of shots fired at a railway station and a nearby hospital sent panicked Mumbaikers scrambling. By Saturday morning, tired of being glued to the TV watching the hostage crisis unfold, throngs of onlookers gathered outside the Taj Mahal hotel -- one of three locations where the gunmen engaged police in a gun battle. They cheered on officers with chants of "Bharat mata ki jai" (Glory to Mother India). Watching the century-old iconic structure in flames was one of the hardest parts for many Mumbaikers, said Dina Mehta. "There's a lot of sentiment associated with that structure," she said. "It's part of our cultural heritage. People can't get past those kinds of visuals." After almost 60 tense hours, the reign of terror appeared to be over Saturday after security forces overtook the Taj -- the terrorists' last stand. Now, residents said, a dispirited city will need to re-channel its feelings of helplessness and frustration into a can-do attitude. "I went to the hospital and there were a lot of people donating blood," said resident Asfaq Tapia. "It was really wonderful to see so many people come out and help." Mehta said many of the people she has bonded with via social networking media, such as Twitter, plan to gather at Cafe Leopold for beer Sunday. The popular hangout for tourists was one of the first locations the gunmen targeted. "We can't let this get to us. Life has to go on," she said. "Most us haven't ever met each other but when you go through something like this, you want a big group hug."